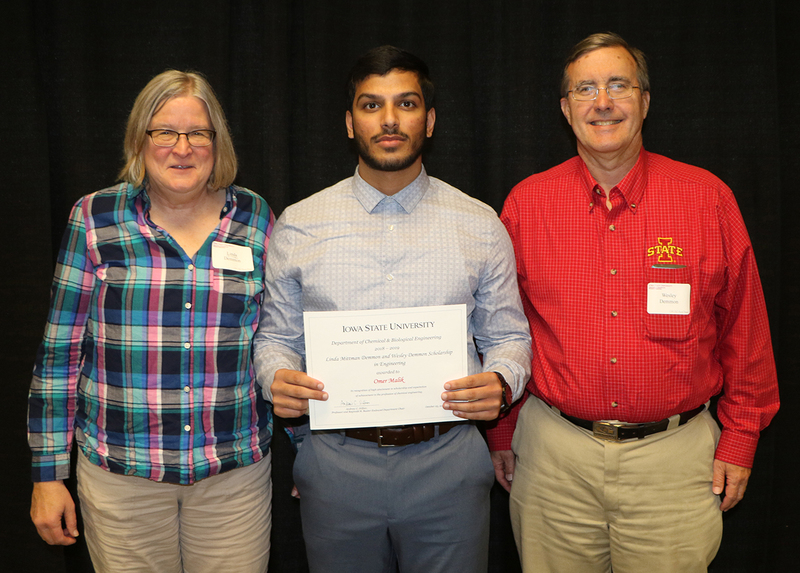 New CBE scholarship donors Linda Mittman Demmon & Wesley Demmon pose with recipient Omer Malik. 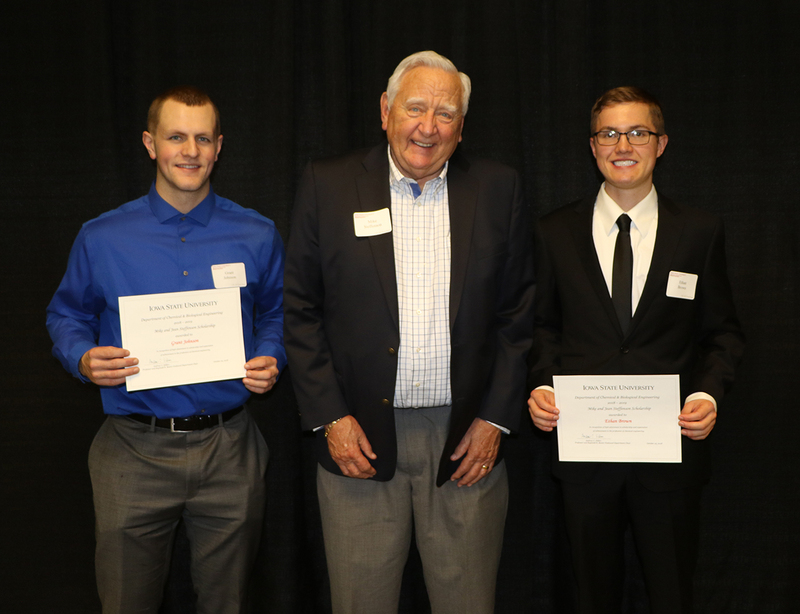 It was an evening of recognition for students and those who support them in the 2018 Department of Chemical and Biological Engineering Honors and Awards Banquet October 25. During the course of the program more than 70 department undergraduate and graduate students on hand were recognized as recipients of scholarships and fellowships in the 2018-19 academic year. 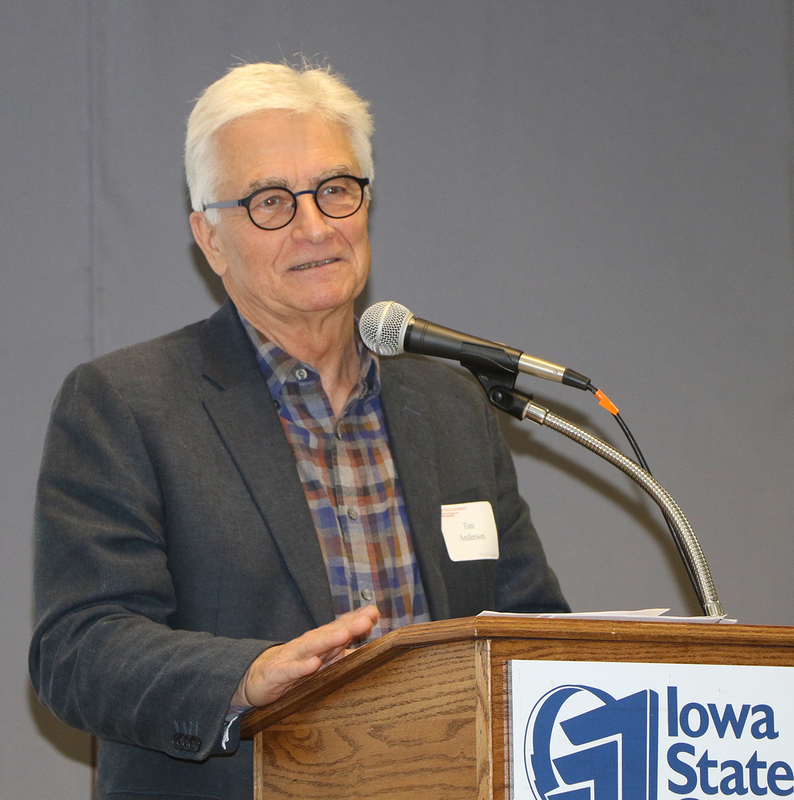 Dr. Anderson addresses attendees at the banquet following his induction into the CBE Hall of Fame. 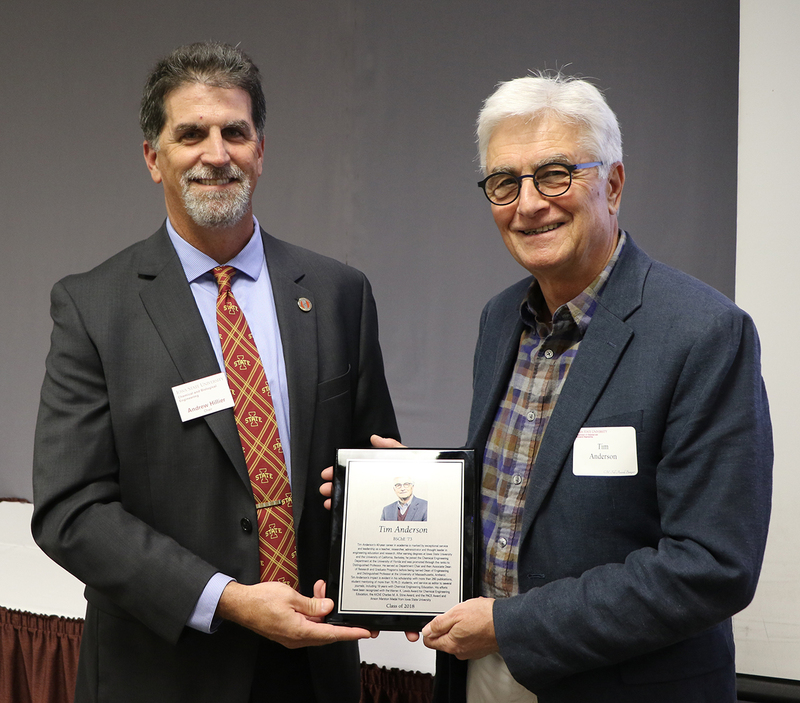 Department alumnus Timothy J. Anderson (ChE’74), distinguished professor and Dean of College of Engineering at University of Massachusetts Amherst, was inducted into the CBE Hall of Fame. 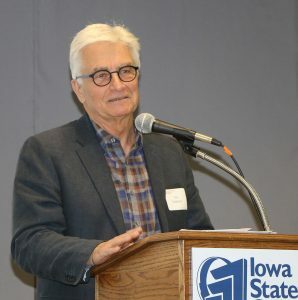 Anderson also received the Anson Marston Medal from the Iowa State University College of Engineering during the annual homecoming award ceremony during his visit to Iowa State and was honored in a CBE department reception with fellow alumnus Jim Fay (see separate story “CBE’s Marston, PACE awardees honored by department”). Student groups were also in the spotlight with presentations from the American Institute of Chemical Engineers (AIChE), including that group’s popular faculty awards; National Organization for the Professional Advancement of Black Chemists and Chemical Engineers (NOBCCHE); and the Chemical Engineering Graduate Student Organization (CEGSO). 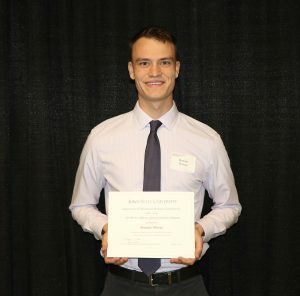 In total, more than $350,000 in scholarship support and more than $120,000 in graduate student support is being contributed by donors in the current academic year. View a full photo album from the banquet on the CBE Facebook page. CBE donor Mike Steffenson joins undergraduates Grant Johnson (left) and Ethan Brown, two recipients of the Mike and Jean Steffenson Scholarship. CBE undergraduate Branden Moreau was one recipient of the new Hershel B. Whitney Global Initiatives Program scholarship, which helps reduce the cost of taking part in the department’s Oviedo, Spain Summer Lab program. Professor Nigel Reuel enjoys being the recipient of two faculty awards from the ISU chapter of the American Institute of Chemical Engineers. 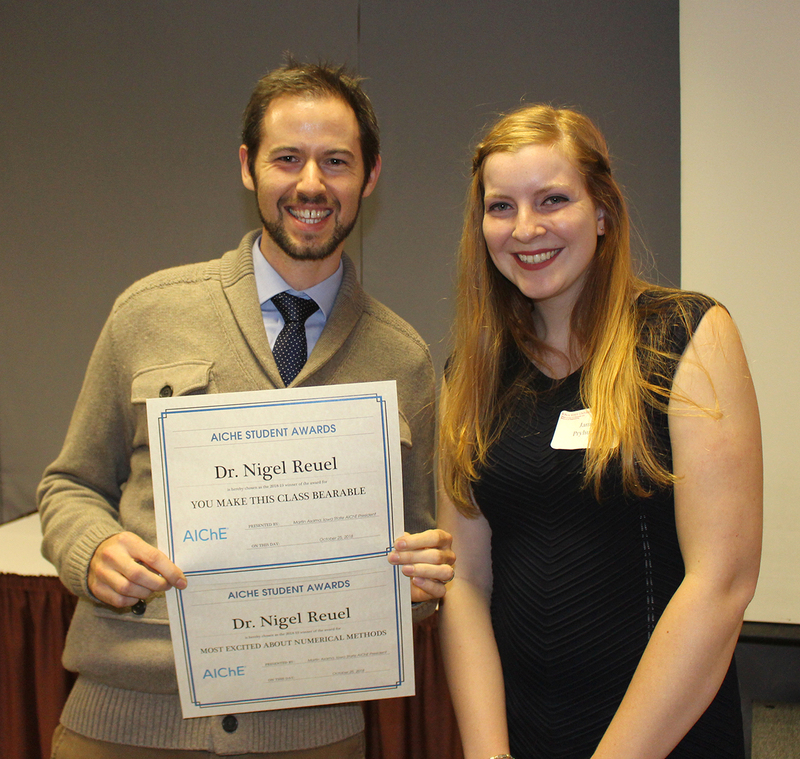 He’s with AIChE member Jamie Pryhuber. Reginald R. Baxter Endowed Department Chair Andy Hillier presents a commemorative plaque to CBE Hall of Fame inductee Tim Anderson.